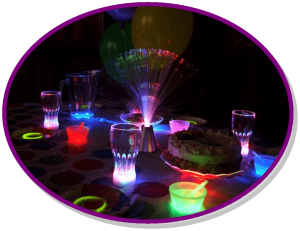 Cosmic Birthday parties are held on Friday night or Saturday Night, from 7:30 p.m. to 11:00 p.m. When the lights go down, the black lights go on and the FUN doesn’t stop! Our DJ plays a mix of Hip Hop, Top 40 and the greatest hits from the 80’s and 90’s! Mix and Match Activities to customize your fun! NEW! Invite Spongebob or a Princess to your party! Don’t forget our Party Extras! Party Mom should arrive 10 minutes in advance of the party. We can not let your guests in until we have your completed guest list. Please present your completed guest list to the cashier upon arrival. The guest list alleviates the issue of paying for non-invited guests/siblings. Please check in with the party host manager when you arrive. At that time she will review the time schedule for your party. Remind your parents that they can skate for ½ price admission on the day of the party if they would like to (*rental $4.00 additional if needed). Parents always ask us how much to tip the party hostess. Although entirely up to you, $2 per child is customary. Please let your party host know if your service was excellent! Tax is additional with each package. A $100 non-refundable deposit and advance reservations are required to secure party. We accept Visa/MC/AmEx/Discover and cash for your deposit. We do not accept checks. We can also accept your reservation over the phone with a credit card. Schedule and Prices subject to change without notice. 4054 Jimmy Lee Smith Pkwy.